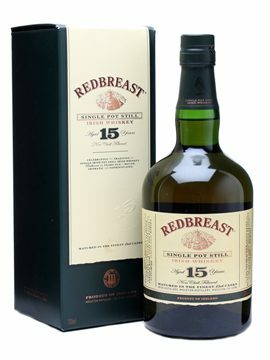 Redbreast 15 is a “Pure Pot Still” whiskey of malted and un-malted barley clocking in at a very welcome 46% ABV. This triple distilled spirit was created at New Midleton Distillery. A quick word on “Pure Pot Still:” the only thing preventing this designation from changing to Single Malt is the fact that un-malted barley is involved. Single malt can only be made from malted barley and is distilled in a single pot still rather than incorporating column distilled spirit. But no one cares, so onto our review. Nose- Rivers of vanilla, butterscotch and rich toffee. Musty oak and ripe banana. Like walking through a confection aisle. Brown sugar with a whiff of cola. Nice grain. Taste- Incredible. Rum raisin richness. Oily, full bodied. Thick with chocolate and oak. Vanilla and cola. Grain. Finish– Medium. Ripe fruit up front. Sherry. Ends on toffee, chocolate. Comments- Well worth the contemplation. Just a wonderful, enjoyable glass of Irish whiskey. And only one of us took issue with the price. That’s a winner, right there.